Sneak Peak of Freedom Life for 2017! DECADE OF DESINTY, YEAR 6- ABUNDANCE! 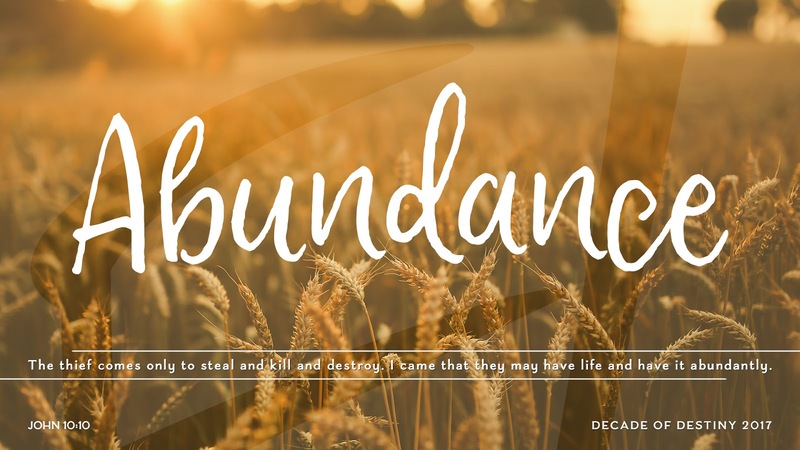 As we close out 2016, I wanted to fill you in on 7 things that you can be a part of in 2017 that will help you experience the abundant life that God has for you! Plan to live a life of abundance by planning now to be a part! 1. FREEDOM NIGHTS (January 4-6)- Ignite your faith and awaken your soul to all that God has for you in 2017! These three nights will propel you into experiencing God's abundance in your life. Come expecting a great move of God in your life & hear from our guests Israel Campbell, Jimmy Rollins & Joe Riddle! During the Freedom Nights at Main Campus, our FL Kids teams will offer a three-day TURN IT UP kids camp! We're not going to be quiet and subtle about sharing God's Word and teaching kids how they are part of God's BIG story! It's going to be a boisterous three nights of worship, games, crafts and learning about how much God loves us! For more information or to register your child, click here. 2. IN THE ZONE MESSAGE SERIES! (January 8-29)- God desires that you would a live a life filled with hope, abundance, and joy. God has a new beginning in store for you! Whatever difficulties you’ve faced, God uses your challenges to stretch you and enlarge your vision to move beyond disappointments and experience his blessings. During this series, we will teach you how to live in the zone, in the sweet spot of God's plan of abundance for your life! Show up to grow up each weekend this January! 3. 21 DAYS OF PRAYER AND FASTING (January 8-29)- We will begin the church-wide fast after communion on Sunday, January 9th and conclude on Sunday, January 29th. Here's the link to the devotional that we will use during the 21 days with more fasting related details to follow soon on our website! Click here and join us. Prayer. Changes. Things. 4. ABUNDANT LIVING MID-WEEK BIBLE STUDY (January 11 - March 29)- We want to help you move forward in experiencing the freedom and life that only God can offer in 2017! We especially invite you to our new 12-week study that will propel you into the abundant life that Jesus desires for you! We will focus on six areas of personal growth: 1. Living in the Tree of Life 2. Walking in the Spirit 3. Surrendering Our Lives to the Lord 4. Learning to Speak Words of Life 5. Becoming a Vessel God Can Use 6. Living as a Worshipper Because no childcare will be provided, we will stream the teachings via Facebook/YouTube Live each of the 12 Wednesday nights so that everyone can participate. 5. SMALL GROUP TERM 1 (February 5- March 26)- You can lead or be a part of a small group this Winter. Your next level always comes disguised as a relationship so connect into our church family with people that will help you go take your faith to a #WholeNuthaLevel! Whether your single, married, young adult or somewhere in between, there is a place for you! Click here for more details! 6. FIXER UPPER (Marriage & Family) RELATIONSHIP CONFERENCE (March 31- April 1)- Friday night will be family night with special guest comedian, Jonnie W (http://www.jonniew.com/) followed by an incredible day of teaching from Eran & Julie Holt (find out who they are by clicking here)! Details will be coming soon, and you don't want to miss out as registration will be limited for this event! 7. THE WHOLE ENCHILADA (January 1- December 31)- From exciting weekly Children & Youth Ministries to Flourish Night, Guys Night Out, Young adult gatherings, Men's & Women Conferences, Serve Saturdays, A21Walk/Run, United Nights, Hillsong Ministry School, Community Care Nights, Powerful guest speakers, Dream Team Celebrations, Fall Festivals, Double Days, Local & Global Missions Trips and more... be a part of changing the world this year with Freedom Life! For more information, go to our website ( www.freedomlife.tv), like us on Facebook or follow us on Twitter!